The farmhouse in Poland faded in our rearview mirror as we set out west across Poland and into the Czech Republic. Drive time was about six hours. Time to get rid of the Polish zlotys and cash in for some Czech korunas. There are about 22 korunas to the dollar. We crossed the Czech border without realizing it and soon pulled off for a pit stop bathroom break. We were hoping to find an ATM to get korunas but no such luck. Europe does not take credit cards nearly as much as the US and strangely enough you don’t find ATMs (or “bankomats”) on every corner like we are used to. So without korunas—and no way to get them— it was going to be a challenge to pay the turnstile to get into the toilet. They did not take zlotys from neighboring Poland and no one spoke English. I debated throwing a kid or two over the turnstile. Necessity is the mother of invention (or is it desperation?) so, after we realized they would accept euros, we ran back to the car and found two errant euros from two weeks prior lurking in the cupholders. We yanked them out into the light and triaged the bathroom situation—only critical people could hit the restroom then we’d get back onto the road ASAP. 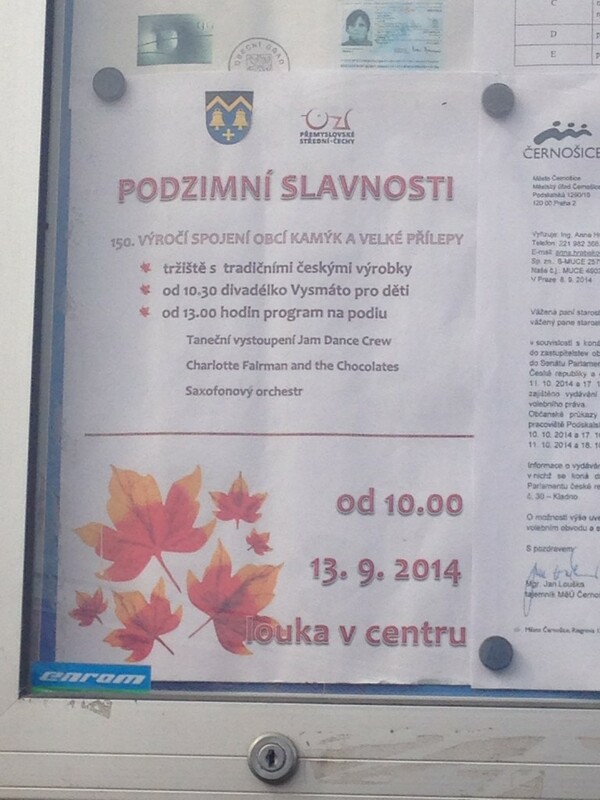 Our place was in Tursko, a bedroom community to Prague. 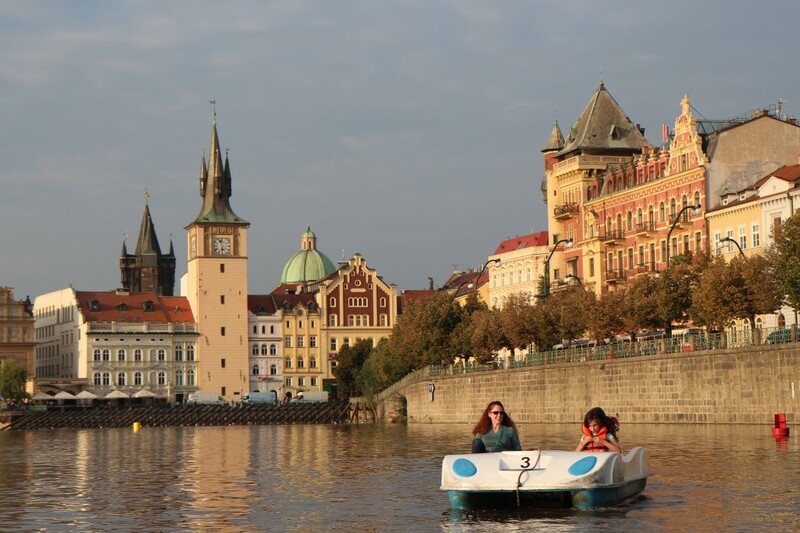 Prague, the “City of a Thousand Spires,” is said to have “made it” as a destination for international travelers. We were drawn by the people we knew who raved about its beauty. Especially as a family our size, we’re tending to stay on the outskirts of cities we want to tour. There are hardly any US hotel brands that have rooms for a family of 6. In Europe, it is even more rare. We scour sites like interhome, airbnb, home lettings, home away and trip advisor for apartments or whatever will work for us. Staying on the fringes of a city generally provides friendlier neighbors, more green spaces, and a lower price. The cost comes in the extra commute time to the City’s famous museums, culture, restaurants, arts, and transit points. With our mixture of school days and travel days it is often a tradeoff we are glad to make. We find the small town of Tursko to the northwest of Prague. Our hosts are Jolana and Jan. They have graciously left a bundt cake for us in our flat upon our arrival. In this place, we are staying in the bottom floor “apartment” of their house. They are so friendly and welcoming and, of course, we love to see their 4-year-old Vojta (“Voy-ta”) wrestling his rubber boots onto his feet at the bottom of the stairs. We first arrive right into the helpful advice of Jolana in how to open the gate and park our car in their courtyard. Then, when I ask her about the nearest grocery store she insists on accompanying me the 200 yards to the store. She does her shopping along with me as I navigate Czech yogurts and try to figure out which dairy product is “coffeemilch”. The store is tiny, maybe 15 feet by 30 feet and run by a Vietnamese couple. There are plenty of German Haribo candies by the door and I later see school kids come in and scoop up quite a few. Lisa is out for a run and notices a piece of paper advertising some kind of local something, with a list of performers (she recognizes “Jam Dance Crew” in English). We choose a word from the flyer to enter into the GPS, thinking it is the town name, Louka. We look it up as best we can but are puzzled because several villages nearby list the name we search on. What now? 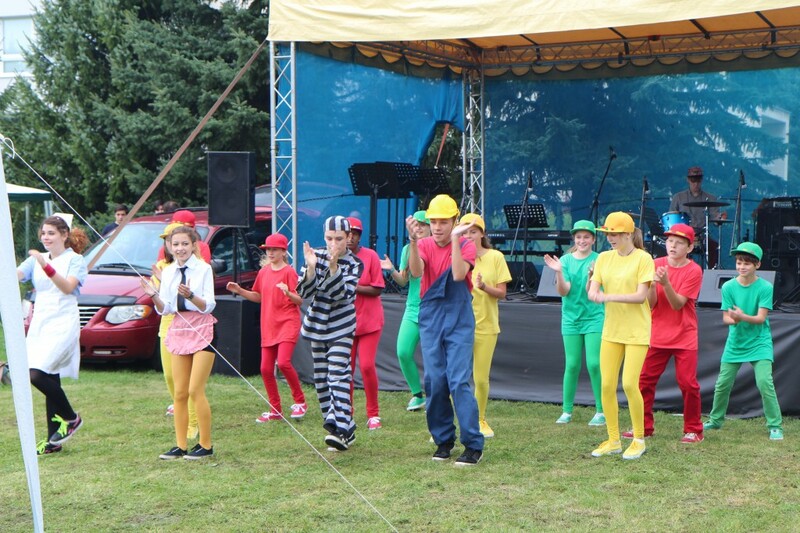 Jolana clears it up for us that it the festival at the nearby town, Velké Prílepy, celebrating the joining of the two towns into one decades ago. We had been trying to find “field” on the GPS. It is a bit scandalous that the new town does not have a central square. The party will be at the field near the center. All villages in Czech Republic have a town square and also a pond. The pond originated as a fire safety provision. Most are stocked with fish, albeit not yummy ones. In the winter, the pond transforms to an ice skating rink for the village. It doesn’t take long for the Czech’s to mention their hockey prowess. Hey, Lisa’s from Dallas, she’s been known to brag about a sport’s team or two. Stick bread is a local delicacy (at least that’s we call it when we’re out camping, thanks to our friends the Bulis family) we also try some type of delicious pasta dish and a bit of grilled sausage. How can you pass that up? 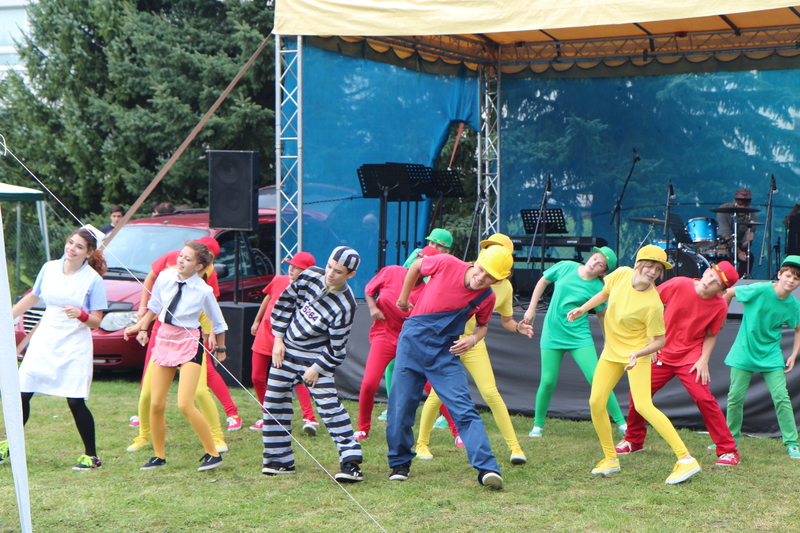 A local dance troupe has clearly been put practicing and they put on a show for all of us. To round out the celebration, a few folks have put out jams, small plants and honey for sale. 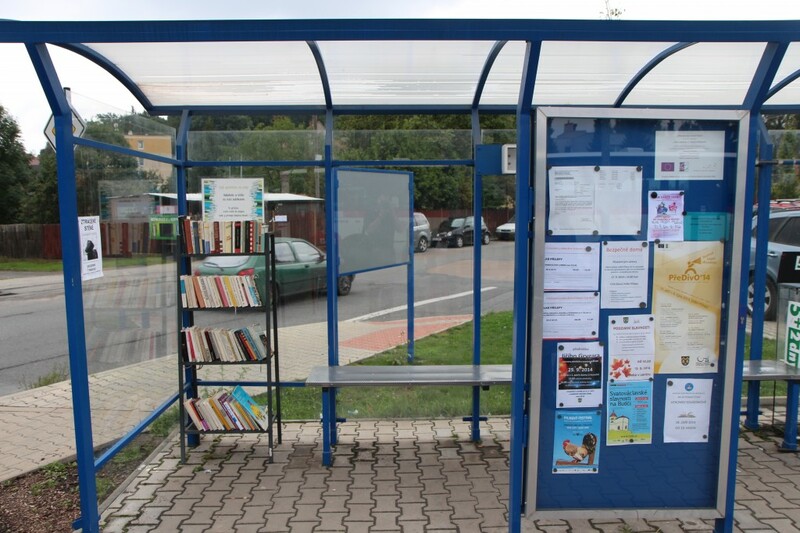 Shouldn’t every bus stop have a lending library? The nearly weekly search for a local church ends with the International Church of Prague. We are thrilled to hear native English speakers. Plenty of Yanks, Aussies and Brits attend this church. 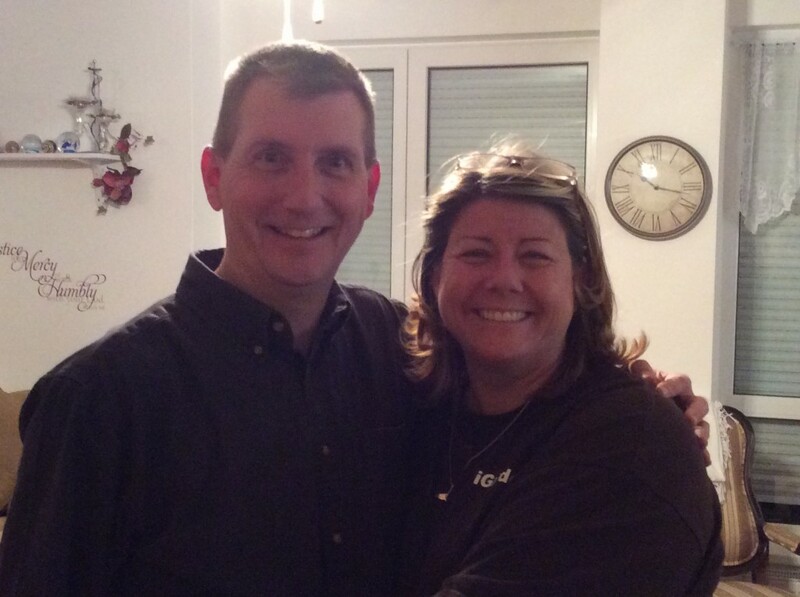 We even meet a wonderful US Air Force family, headed by Keith & Cheryl who are a godsend. We join the expats for lunch after church in the food court of a local mall. The modern mall feels familiar and the Greek place let’s us grab food from the other places and congregate in one spot. Talking American sports with some real life ‘Mericans makes our day. Keith & Cheryl even invite us over for dinner and their wonderful family (with five girls and four of them still at home) is a joy to be around. Out of his 20+ year career, they have spent nearly all of it overseas. What a privilege to meet new people and see the fellowship we can have even halfway around the world. 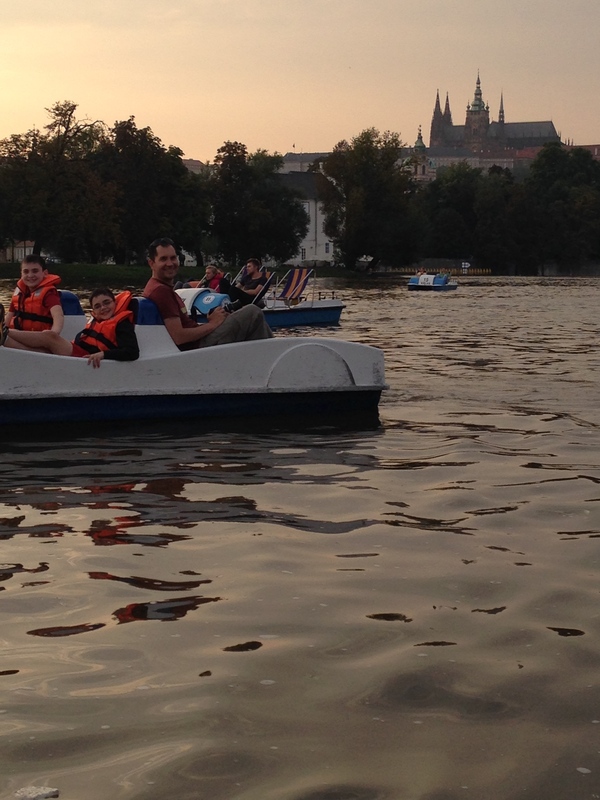 Prague is a welcoming city and as this family of six jaunts about, we are always on the lookout for the next city bathroom. These signs greeted our arrival at the WCs (water closets, or toilets). So, are you a Ženy or a Muži? It’s probably a good clue that the more defaced sign likely had more vandals heading up and down the stairs. Are there female vandals? It seems like a male-dominated activity. We got you beat on that one, ladies. Seeing your gender emerging from the downstairs restroom also helps. 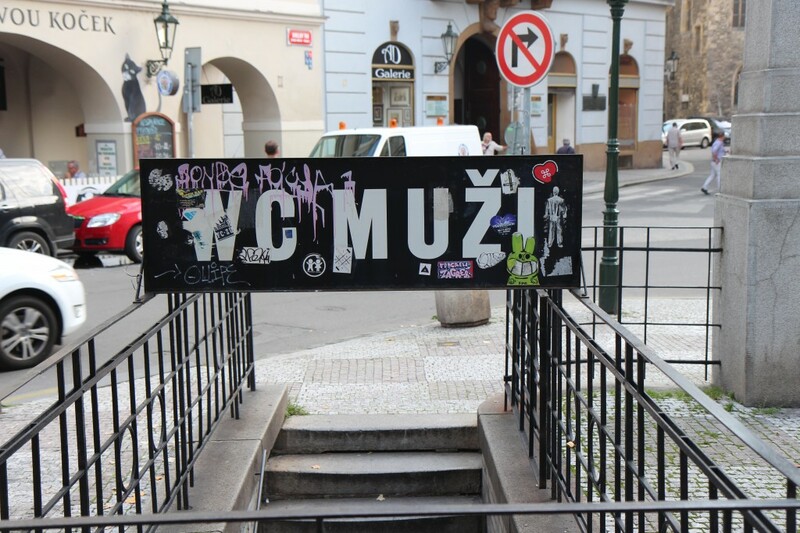 To keep you from having to go to Google Translate as we often do—Muži are men and Ženy women. 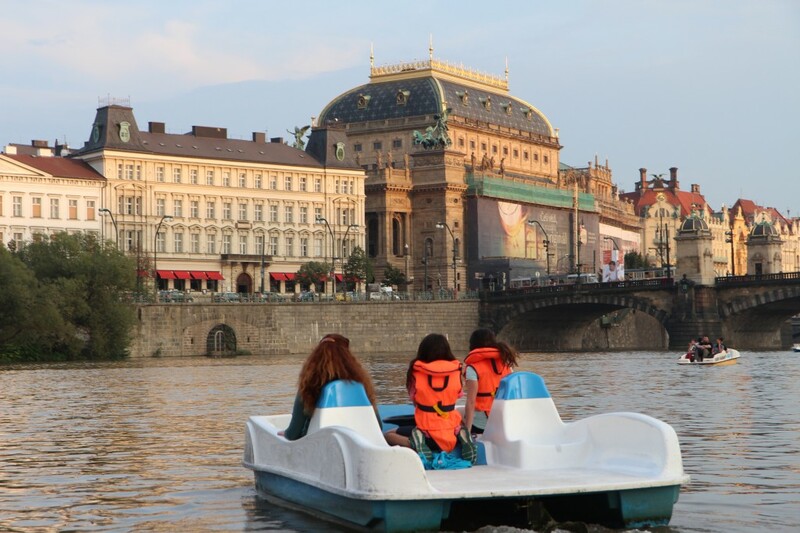 On this first foray into Prague we search out the paddle boats on the Vltava river. 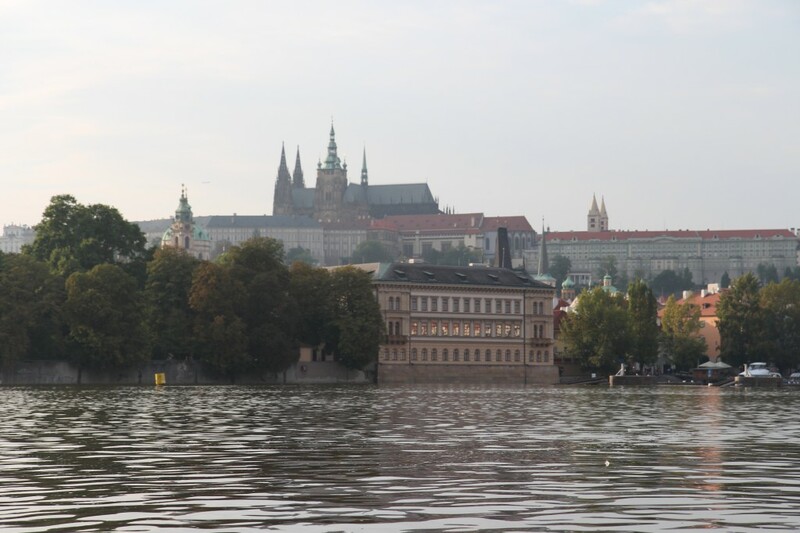 The river is crossed by 18 bridges within the city, especially the famous Charles Bridge. Paddle boating a great introduction to the views of the city, including the urban oasis island complete with city dwellers enjoying a snack during the day and views of Castle Hill and the Opera House. 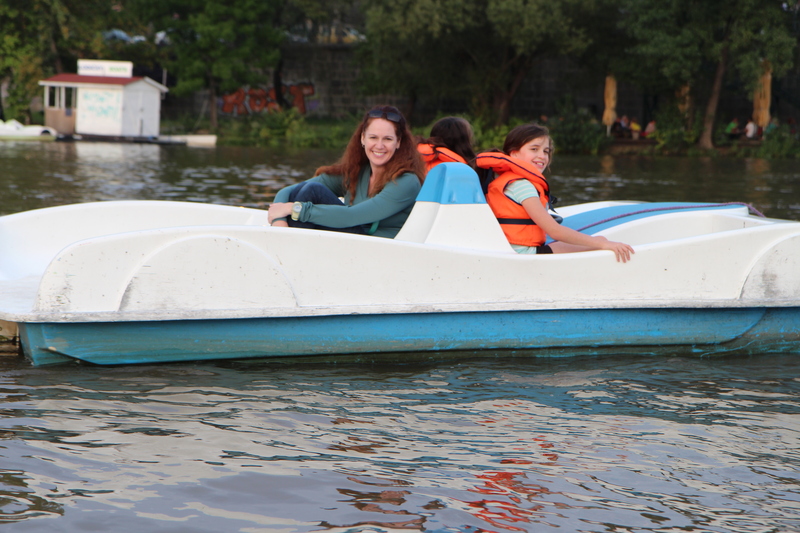 It’s also good practice for Lisa to not be afraid the kids are going to fall in and drown. But we are most excited to chase each other around the river. I drive the car to the slightly larger grocery store so I can stock up. The store sells food and luggage, among other treats. I can’t help notice a teenage girl shopping for clothes with her Mom in the middle of the store. 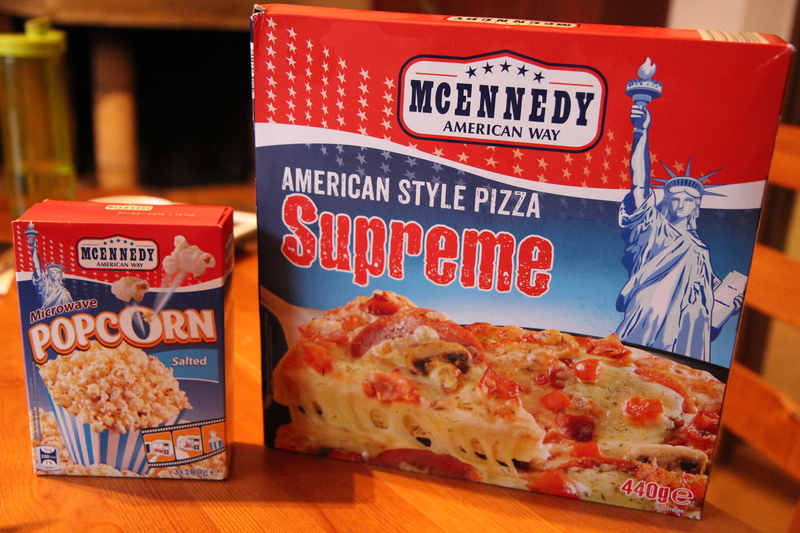 Of course, I can’t resist the “American” items but I decide to forego the toilet seat purchase. I can run some mornings and get workouts when I can. I wear an UP24 band to track my sleep and my daily steps. They’re some of the ways I do what I can to be healthy. I am quite aware of certain afternoons when fatigue sets in and I fight off the nap. It seems to come about the days I get out for a run but there’s no obvious correlation. Prayer, most of all, is how I know to fight. That is where the power is. He knows my days and I am kept. Friends, I thank you so much for your time in reading about our story. Stories are so important, powerful, and potentially life-altering. I believe our family—like every family—has a unique story to tell. For us, our story has really changed in the last two years since that diagnosis came in. I feel I am just beginning to learn how to tell this story of our family. We are taking time to invest in our family and we pray it will be a worthwhile adventure for us. It is a thrill to have you join us as we seek to chronicle this trip, to celebrate a time of being healed and together and to connect with each of you. We are making it up as we go along on this new, grand adventure and every place and every sunrise brings a new set of opportunities to pick from. We are surely being challenged and learning at every speed bump, every intersection, and every smooth road. To me, that sounds like an analogy for parenthood. And for life! Lisa and I thank you from the bottom of our heart for taking time from your busy day and hope you are finding joy in your day today! These small peepers continue to show me how to find the joy in the day no matter where your parents have drug you to! 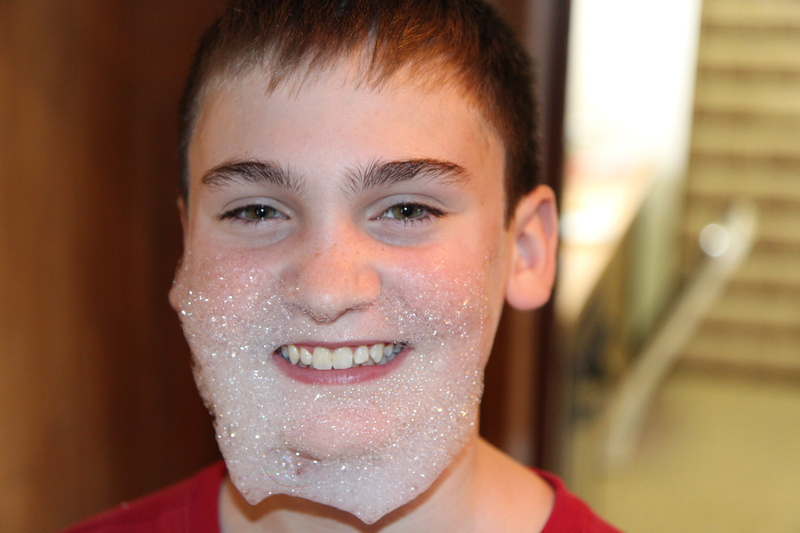 Sometimes, when it’s your turn to do the dishes you just have to get some good use out of all those bubbles! Have all Mesquite Family Adventures in my bemesquite file…..
Brent – Loved the Zeny / Muzi discussion! It’s a joy to read your travelogue and laugh with you. Glad you are having fun, it certainly shows! Bless you all. We thank you for letting us join you in this wonderful journey you are taking your family on. Some of us will never see or experience all you have seen. The kids will never forget the journey and wonderful adventures they are experiencing with their parents. I loved the Bus stop lending library, and the bubble beard! So much fun! Keep praying for you guys. Love reading every blog you post and following your great adventure! I also like the bus stop lending library. Praying for good health and safe travels for all. We love reading about your adventures. You make me want to go back to Europe and do it Mesquit style. 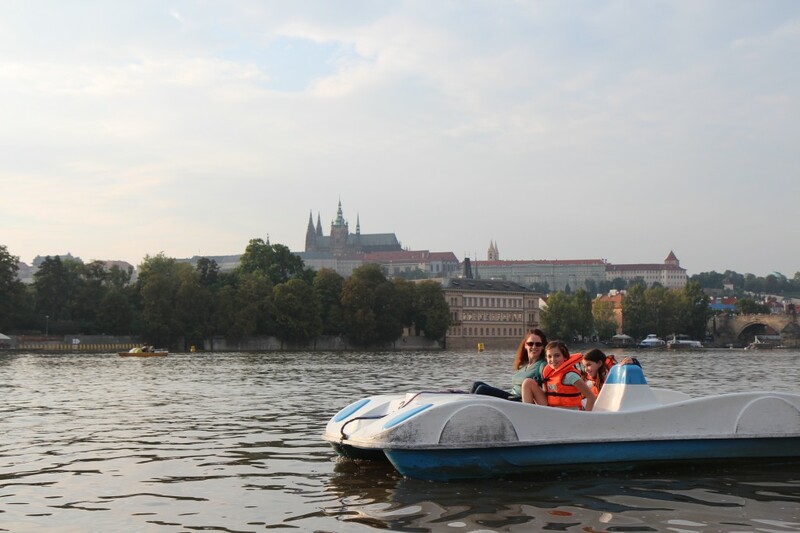 Loved Prague. Would love to go back some day! THANKS for sharing! !